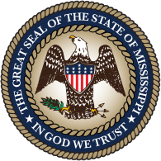 Mississippi law requires that grain dealers and grain warehouses be licensed by the Mississippi Department of Agriculture and Commerce, unless they hold a license from the federal government. The Mississippi Grain Dealers Law requires that dealers who purchase grain directly from producers must be licensed and bonded. Operations or individuals who are not licensed are prohibited by law from purchasing grain from producers. Warehouses that store grain for the public in Mississippi are required to be licensed pursuant to the Grain Warehouse Law, unless the warehouse is licensed under the United States Warehouse Act. The law requires the warehouse to post the license in a conspicuous place in the office of the grain warehouse. Grain warehousemen must be bonded for financial and storage obligations and they must maintain sufficient assets to cover potential losses. Bonding requirements of the law range from a minimum of $15,000 to, in general, a maximum of $1,000,000.